Now, massive handfuls of turmeric capsules are no longer needed, reducing the chances for stomach upset or ‘turmeric burps’. One (1) easy capsule, shown in clinical research is equal to about 20 capsules of unoptimized curcuminoids extract. That’s a time and money saver. Longvida is an optimized form of curcumin, the primary compound present in turmeric root extract. Curcumin is a well-studied, scientifically-tested compound that acts as an antioxidant and an inflammation-supporting agent; it also promotes cognitive health and longevity*. Curcumin’s benefits are wide-ranging and impact several areas of your overall health, but the biggest challenge that scientists have faced is how to make it bioavailable enough that sufficient amounts of curcumin are absorbed and used by your body. Longvida is the answer to that question*. Discovered by fortuitous accident by scientists trying to increase turmeric bioavailability, Longvida utilizes a patent-pending approach that’s designed to preserve the integrity of turmeric extract in the harsh environment of the stomach, promoting rapid absorption into the bloodstream and optimal delivery to target tissues*. 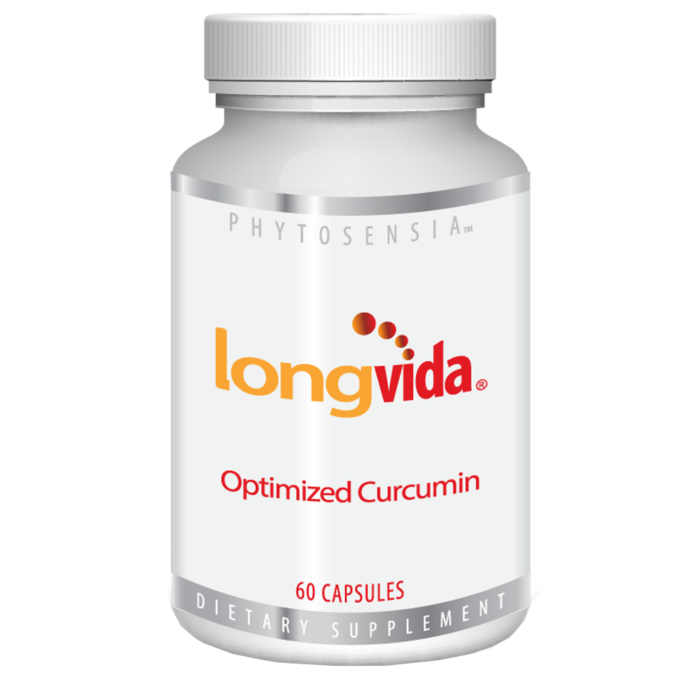 After years of development, Longvida’s formula stands as the solution to the bioavailability issue with curcumin, and its unique process is now known as SLCP™ Technology. Longvida’s optimized turmeric extract supports cognitive and overall health and provides antioxidant and inflammation-supporting benefits*. Over 3,100 publications have been completed on the beneficial effects of curcumin. Clinical trials have shown that one small daily dose of Longvida produced significant health benefits in only 30 days. An overview published in Advanced Experimental Medical Biology stated that curcumin had exhibited important antioxidant, inflammation-supporting, and immune-enhancing properties. As an antioxidant that passes the blood-brain barrier, curcumin can promote and support brain health by fighting free radicals, which can cause oxidative stress for cells. This antioxidant protection has wide-ranging effects, from helping sustain memory function to promoting optimal cognitive function*. Curcumin induces bile flow, which helps break down fats, and can help maintain healthy levels of triglycerides in the bloodstream. Turmeric extract can also protect the gastrointestinal tract and regulate secretion*. Because curcumin can help support triglycerides, it promotes heart health; it can also help maintain healthy levels of LDL cholesterol and promote optimal blood vessel health*. As an inflammation-supporting agent, curcumin helps improve joint comfort and promotes optimal joint health and motion*. Contains no gluten, yeast, animal products, sugar, hydrogenated oil, artificial coloring, artificial flavoring, or preservatives. Contains all GRAS (generally recognized as safe) ingredients. Does not contain piperine or turmeric volatile oils. Meets or exceeds California Prop-65 daily levels for heavy metal consumption. Meets or exceeds USP/ICH standards for residual solvents. Tests negative for genetically modified proteins. Processed without ethylene dichloride. 1-2 capsules once a day, between meals or as recommended by your healthcare professional. Store tightly in a cool, dark, dry place.